SIOUX FALLS, S.D. 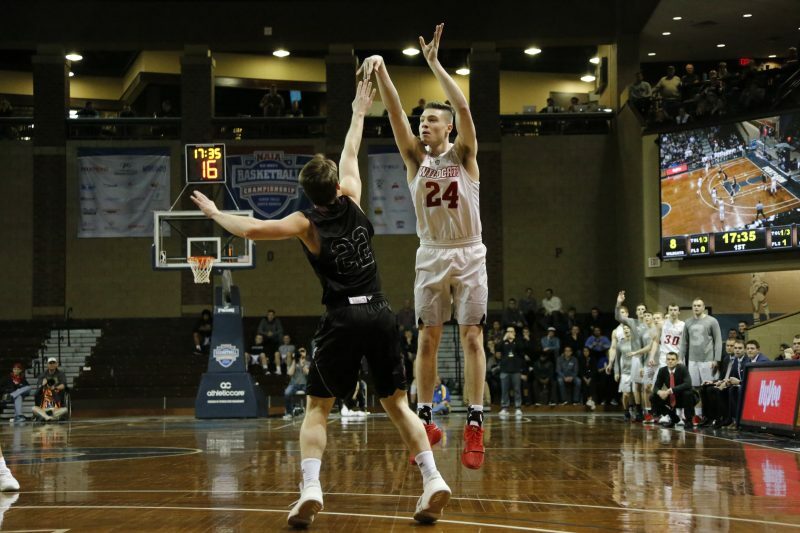 – Kyle Mangas wasted no time in etching his name into the Indiana Wesleyan basketball record book Saturday night. Mangas scored a hoop just 1:22 into another Wildcat win in the national tournament to become the program’s all-time single-season scoring leader. Freshman Mangas, a former star at Warsaw, set the record in true Mangas vintage form. The 6-3 blue collar, throwback guard caught a pass in the pant and turned and banked a short shot in off the glass to get his team going early in the contest. Mangas scored 19 points as No. 4 IWU topped No. 5 Morningside (Iowa) 86-68 in the NAIA Divison II National Championships. The Wildcats, who move to 29-7 with their seventh straight win, advance to play No. 1 overall seed IU East in a semifinal game Monday at 7 p.m. It will be the third straight trip to the semifinals for IWU and its fourth in the last five years. Mangas, who finished fourth all-time in career scoring at WCHS, now has 775 points this fabulous freshman campaign. He passes Lane Mahurin, who scored 756 during his senior year in the 2016-17 season. Durand “Speedy” Walker had the record with 725 from 1982 until being passed last year by Mahurin. Mangas had 19 points and a game-high 13 rebounds in the win Saturday night. Evan Maxwell, a 6-10 junior forward, continued his stellar tourney play with 22 points for the Wildcats. The duo of Mangas and Maxwell, a transfer from Kansas, have also set a single-season scoring record with their combined total of 1,405 points this year. The previous mark was held by Mahurin and Bob Peters, who tallied 1,366 during the Wildcats’ national title run in 20-17. The Wildcats started the game Saturday with an 8-0 run. IWU then used a 23-8 run to take a 43-26 halftime lead en route to the win. IWU dominated in points in the paint with a 46-18 scoring edge and also had a 48-26 rebounding advantage. The Wildcats also held Morningside to its second lowest point total of the season. Mangas is averaging a team-high 21.5 points-per-game for the Wildcats. He leads the team in minutes played and 3-pointers and ranks second in both assists and steals while also averaging 5.2 rebounds per game. Mangas is shooting 52 percent overall from the field on the season, including 38 percent from distance. He is shooting 79 percent from the free throw line. Mangas, the son of Tim and Ann Mangas, was an Indiana All-Star in 2017 after leading coach Doug Ogle’s Warsaw team to its second straight Class 4-A sectional title and its third consecutive undefeated championship season in the Northern Lakes Conference during his stellar senior year. Mangas finished his prep career at WCHS fourth in program history with 1,450 points. He trailed only Mr. Basketball winners Kevin Ault and Jeff Grose and Mr. Basketball runner-up Nic Moore. Mangas led the Tigers to a 61-17 mark during his phenomenal high school career. He scored 633 points during his senior season, the fifth highest total in program history. Mangas, as consistent and clutch as they come, earned the Crossroads Player of the Year and Freshman of the Year honors after leading IWU to both the regular season and conference tournament titles. He is the first freshman in league history to earn POY honors. Maxwell is averaging 17.5 points-per-game and 6.5 rebounds per night for the Wildcats. IU East beat Briar Cliff 76-68 Saturday in other quarterfinal play. Saint Francis, another member of the Crossroads League, topped Cornerstone 90-79 and the College of Idaho defeated Marian, another Crossroads League member, 75-47. IWU plays IU East (34-2) Monday in the first semifinal game. The College of Idaho (30-6) then meets Saint Francis from Fort Wayne (28-8) in the second semifinal. The championship game is set for Tuesday night.